In 2013, the Government of Canada announced the Venture Capital Action Plan (VCAP), a market-oriented approach to putting Canada's venture capital industry on the path to sustainability and increasing the availability of financing for innovative Canadian firms. Under VCAP, the Government's investment of $390 million has attracted significant investments in the venture capital industry in Canada. 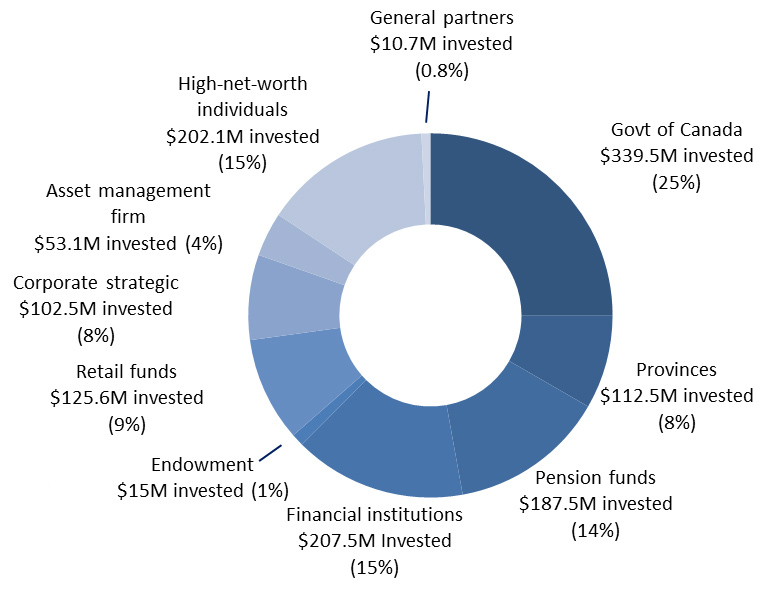 In particular, the four VCAP funds-of-funds attracted investments from a diverse set of investors that included pension funds, high-net-worth individuals, corporations, banks, and the governments of Ontario and Quebec. Including the federal government investment, the four funds-of-funds raised $1.356 billion. Of that total, $904 million came from private sector investors. Canadian-based sources account for 95 percent of the capital, while 5 percent was from American and European investors. In total, investments under VCAP have to date translated into $849 million committed to 27 Canadian fundsFootnote 11. Further, VC funds that have received support from the VCAP program have invested $1.24 billion into 249 Canadian companies to date, with more expected as the capital is invested in the years to come. VCAP aims to make Canada's venture capital industry more globally competitive, while ensuring that Canada's high-potential firms have the resources they need to grow and create jobs. Metrics in this section relate to the activities associated with the four VCAP funds-of-funds. The four funds-of-funds raised $1.356 billion from public and private sector investors, including approximately $340 million from the Government of Canada. Metrics in this section relate to the activities associated with the four high-performing venture capital funds, which together received a commitment of $50 million under VCAP. Note: One of the high-performing funds was also supported by a fund-of-funds; therefore, a total of 27 funds have received funding under VCAP. Metrics in this section relate to the overall activities associated with the four VCAP funds-of-funds and the four high-performing venture capital funds that received VCAP investment. Total invested in Canadian companies up to December 31, 2017 was $1.24 billion. This includes investments by High-Performing Funds, Funds-of-funds, and underlying funds. Number excludes high-net-worth individuals and family offices. Upon review, $10M has been re-classified as a Canadian private LP, thus reducing the total funds raised from the U.S.
"Canadian Funds" are defined as having their primary office in Canada and a majority of investment professionals residing in Canada. Includes 2 Ontario funds managed by one fund manager, which total $196M in commitments. The total committed to seed investments has been reduced due to a re-classification of an investment that was erroneously labeled as a seed fund. Capital called is the cash that the funds draw down for their activities. Cash distributed is the amount returned to investors. Fair value refers to the value of the remaining investment. Total Value = Fair Value + Cash Distributed. Total Value to Paid-In = Total Value ÷ Capital Called. One of the high performing funds was also supported by a fund-of-funds; therefore, a total of 27 funds have received funding under VCAP. Companies categorized as "Other" have been reclassified into the different stages that are generally accepted within the VC industry.